Last week, an appeal court changed the prison sentences against Azerbaijani human rights and peace advocates Leyla and Arif Yunus into suspended sentences and both of them have now been released from detention. However, other well-known human rights defenders and journalists who have been arrested and criminally charged during the ongoing, unprecedented civil society crackdown in Azerbaijan remain behind bars. 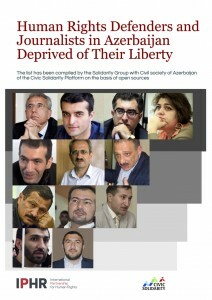 The Civic Solidarity Platform’s Group of Solidarity with Azerbaijan’s Civil Society has compiled a document providing brief profiles and case information on 12 human rights defenders and journalists who have been deprived of their liberty due to their professional activities and the peaceful and legitimate exercise of their fundamental rights and freedoms. Help spread the word using this document and mobilize support for human rights defenders and journalists who have been unjustly denied their freedom in Azerbaijan! International Partnership for Human Rights (IPHR) and other members of the Civic Solidarity Platform (CSP) continue to call for the charges to be dropped against all Azerbaijani human rights defenders and journalists who have been criminally prosecuted on politically motivated grounds, as well as for the immediate release of those who are still in detention or prison.